A Scene That Brought Back Childhood Memories. My husband and I were out for a drive one evening. There were road works on the main road into town so we took another route. 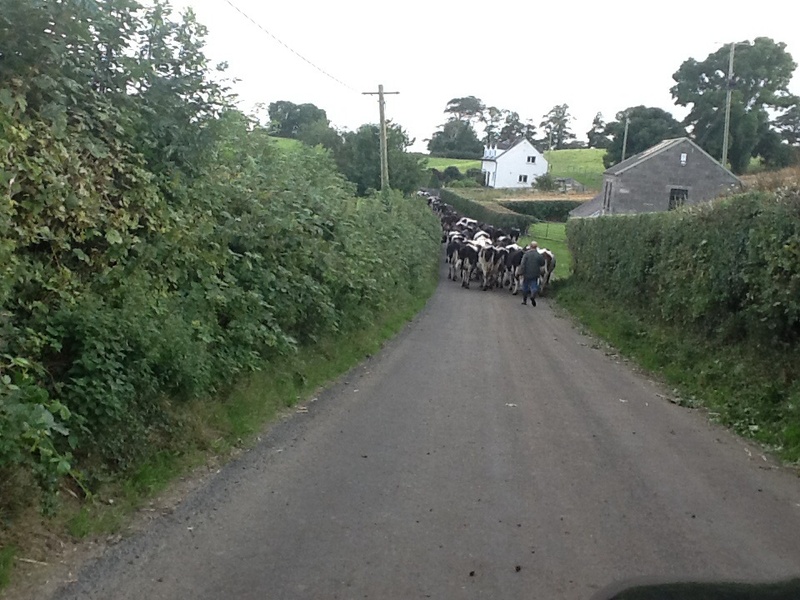 We came upon a farmer bringing his cows in from the field to be milked. It was just as well we were not in a hurry. The docile creatures with full udders ambled back to the farm yard. The farmer opens the gate and the cattle lift their heads and turn for home. We drove behind the farmer patiently. I grew up in Co Down. My father was a dairy farmer too. I remembered my sisters and I bringing the cattle back from the meadow in the summer evenings. The cows would swish the flies away with their tails. We had a pet cow that let us have a lift on her back home. Cattle grazing in the meadow beside a stream, where there is fresh water is a picture of abundance. The Lord describes the Promised Land as a place flowing with milk and honey. Wherever there is cattle one will not grow hungry. Then the Lord said to Moses, “Leave this place, you and the people you brought up out of Egypt, and go up to the land I promised on oath to Abraham, Isaac and Jacob, saying, ‘I will give it to your descendants.’ I will send an angel before you..
My parents worked the farm to raise ten children. We had plenty of milk, cream, buttermilk and butter, rich food to feed us. Pharaoh said to Joseph, “I had a dream, and no one can interpret it. But I have heard it said of you that when you hear a dream you can interpret it.” “I cannot do it,” Joseph replied to Pharaoh, “but God will give Pharaoh the answer he desires.” Then Pharaoh said to Joseph, “In my dream I was standing on the bank of the Nile, when out of the river there came up seven cows, fat and sleek, and they grazed among the reeds. Seven years of great abundance are coming throughout the land of Egypt. The picture of the cows walking home to be milked has stayed with me. We have often spent holidays in Co Kerry, Ireland. Last time we were there a herd of ninety cows filed past to the back of our house at six every morning and evening. They knew it was time for milking. The farmer did not even have to call them. I believe God was showing me His provision of abundance then as well. Let us believe God’s word today. Let us have faith to enter into our inheritance of a land flowing with milk and honey.